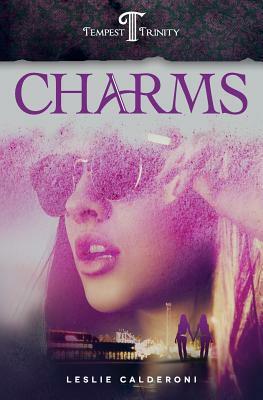 Charms is the first book in Leslie Calderoni's Tempest Trinity, a smart new Young Adult trilogy packed with mystery, girl power, and the magic of science. Few forces are stronger than the bond of sisterhood. The laws of physics are a close second, though--at least for Emerald, Mia, and Terra, three teenagers whose talents allow them to control time, talk to people no longer living, and manipulate the string vibrations that make up the universe. Even with these "charms," the girls have their work cut out for them when faced with an elaborate thread of mysteries: What family secret is Mama and Auntie Eva trying to hide from them? What is Colin, the menacing boy from New Orleans, so desperately looking for here in Santa Cruz? Matters are further complicated when Emerald is blindsided by an instant and highly impractical attraction to a new boy in town. Together, the Tempest sisters must unravel these mysteries before family tensions boil over, all the while still learning the nature and extent of their powers. Leslie grew up in Silicon Valley, and after years of working for cool companies like Electronic Arts and Google, she took her love of science and storytelling and combined them with her passion for girl power to write this first book in the Tempest Trinity trilogy. She lives less than a 15-minute drive from the beaches of Santa Cruz.